Celestial Church of Christ. 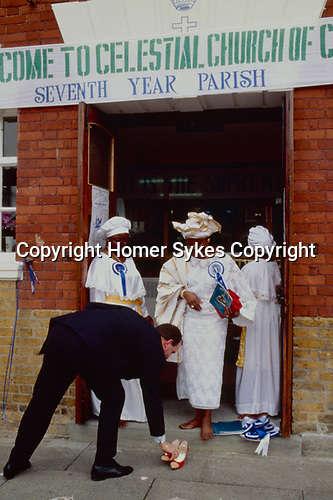 Woshipers at 'Cele' must leave their shoes at the entrance to the church (Exodus 3, 5 ) As Mrs Ojara wife of Chief Ojara leaves the Seventh Year parish in Londons East End. Her chauffeur deferentially returns her shoes.